I often find similarities between western and oriental food like this stir fried potato which is similar to rustic English bubble and squeak (not the cake shaped type). Here to introduce to you a classic home cooking from Yunnan called lao nai yang yu 老奶洋芋 or old granny's potato. The reason why old granny or lao nai 老奶 is named after this is because this potato dish is soft suitable for grannies with no teeth. 馬鈴薯 direct translation is horse bell potato (I have no idea why and where this name came from), this term is more commonly used outside China, like in S E Asia. In Chinese nai 奶 usually means milk. When we say nai as milk the tone is lower. A double word nai nai 奶奶 (in a higher tone, spoken in Mandarin) refers to paternal grandma or a general term for old lady or granny. Enough of Chinese lessons, back to this lao nai yang yu. It is quite a simple home cooking. Cooked potato is mashed or crushed then stir fried. 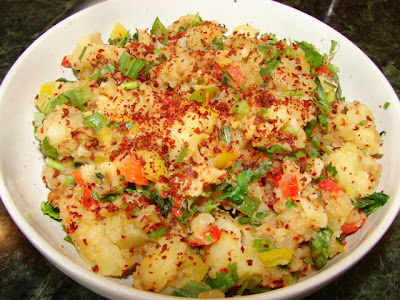 Garlic, spring onion, dried chilli/chilli flakes and ground Sichuan pepper are commonly added to flavour the potato. Fresh and pickled vegetables can be added to add texture, colour and flavour like pickled mustard, pickled cabbage, Sichuan preserved vegetable (zha chai), carrot, celery, onion, sweet pepper, fresh chilli etc..... For a more luxurious touch, Yunnan air dried ham* can be added if available for the meat eaters, if not normal chopped ham can be added too. For this recipe I boiled 3 potatoes (about 350g), leave it to cool then crushed. Chop a small handful (about 50g) of Sichuan preserved vegetable or zha cai, rinse to remove the salt then squeeze dry. Chop a cup of different colour sweet pepper. I used red, yellow and green. Heat the wok with some oil, fry the garlic then add Sichuan preserved vegetable. Stir and add the chopped pepper. Add the crushed potato. Keep stirring till heated through. Then add just a little light soy, not too much the preserved vegetable can be very salty. Sprinkle on a little ground sichuan pepper and chill powder. Stir and add the spring onion and coriander. Ready to dish up. Sprinkle on a little more chilli powder if wish. Serve hot. Note: I find freshly boiled potatoes can be a bit sticky to stir fry. I prefer to use boiled potatoes that has been chilled, drier and less like to stick to the wok. * Yunnan ham 宣威火腿 is a famous air dried Chinese ham from Yunnan region. This ham is similar to Parma ham or Serrano ham. Lovely fragrant ham, normally eaten steamed or flavoured soups. This is another example of similarity between Chinese and Western food. Yunnan ham is available in most Chinese dominated S E Asia countries especially around Chinese New Year but alas it is banned in the west due to meat import regulations. Oh wow, I've never heard of this but it sounds really good! I appreciate the Chinese lesson :) The dish sounds good, too! This is really lovely!! Thank you. I can cook this dish again and again...with different flavours (e.g. with different kinds of meat) etc. Great site, great recipe! I'm American but I've been looking for a good version of this recipe forever--my girlfriend studied abroad for one semester in Kunming; when I visited, we ate these potatoes often! Then we moved to Chengdu for a year (during which time we visited Malaysia and fell in love with that country and its food, too). I love this blog--these recipes are the REAL thing and bring back so many memories!